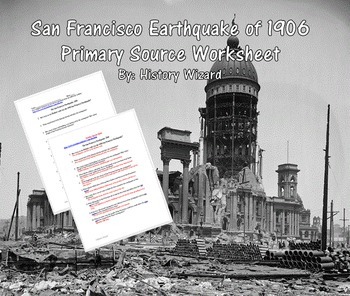 This activity includes an internet based primary document and worksheet on the San Francisco Earthquake of 1906. 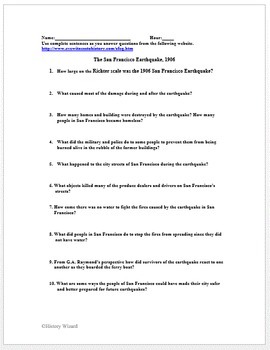 I use the worksheet to help students better understand the importance of San Francisco and the damaged caused by earthquake, The worksheet has 10 questions and a teacher answer sheet is included. The worksheet with discussion can take between 10 and 30 minutes. 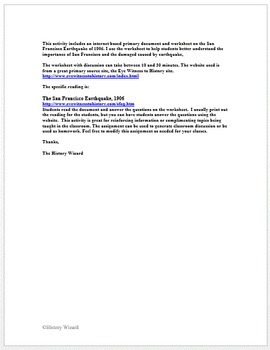 The website used is from a great primary source site. Students read the document and answer the questions on the worksheet. I usually print out the reading for the students, but you can have students answer the questions using the website. This activity is great for reinforcing information or complimenting topics being taught in the classroom. 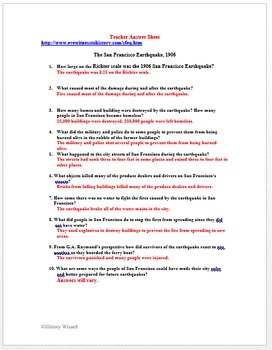 The assignment can be used to generate classroom discussion or be used as homework. Feel free to modify this assignment as needed for your classes.